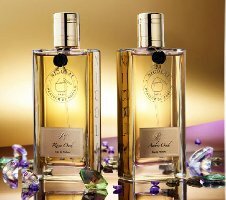 French niche brand Parfums de Nicolaï will launch Rose Oud & Amber Oud this month. Rose Oud ~ a woody floral with raspberry, davana, osmanthus, rose, lily of the valley, agarwood, patchouli, sandalwood, vanilla, musk, castoreum and amber. Amber Oud ~ a woody oriental with lavender, thyme, sage, davana, cinnamon, saffron, agarwood, Atlas cedar, patchouli, sandalwood, vanilla, tonka bean, styrax, musk, castoreum and amber. Parfums de Nicolaï Rose Oud & Amber Oud will be available in 30 and 100 ml Eau de Parfum. This joke with the bloody oud or agarwood isn’t funny anymore. Sometimes I just wonder where the hell they find ALL that supposedly rare oud OR agarwood.. Oh dear.. I don’t think anybody is even pretending it’s not synthetic any more. I think there are now some companies manufacturing some variation of natural oud. Oh, natural oud is definitely available. But it is not what is fueling the oud boom. I’m trying to think of a brand that hasn’t fallen. There aren’t many. I know. It’s just at this stage it’s less jumping on a bandwagon as it is flogging a dead horse! CdG has used agarwood, but I think it’s drawing more from the Japanese usage. LesNez, Serge Lutens, Parfumerie Generale, and Parfum D’Empire? Fair comment (re the ubiquity of oud) but if anyone is going to make me want to sniff ANOTHER oud fragrance it’s Patricia de Nicolai. I am particularly interested in the Amber variant. And anyway, 30ml bottles people! And that is true too! I so agree. When I saw the announcement on this blog, I was actually quite excited. She tends to do orientals so well. And 3 loud cheers for those wonderful small bottles. May have to find time next month to pop into the Fulham Road shop when I’m in London, though that will be more to see if they still have any of the reportedly discontinued Le Temps d’Une Fete than to smell either of these! LTdUF my favourite of hers, in both its incarnations. Any day now I will walk down the supermarket laundry/bathroom aisle and see a detergent scented with oud (Jasmine Oud – “for a sparkling clean just like washing in the Ganges”) or an aerosol air freshener (Ozone Oud – “just like the scent of a night market in Patpong”)…. I would like to thank Robin for talking about our new OUD in her blog. The entire NICOLAI team is also very aware by all the comments provoked by the post. Thank you very much and ‘Joyeux Noël’ to everyone!